MIO-ECSDE & MEdIES join the International Coastal Cleanup Day 2014! 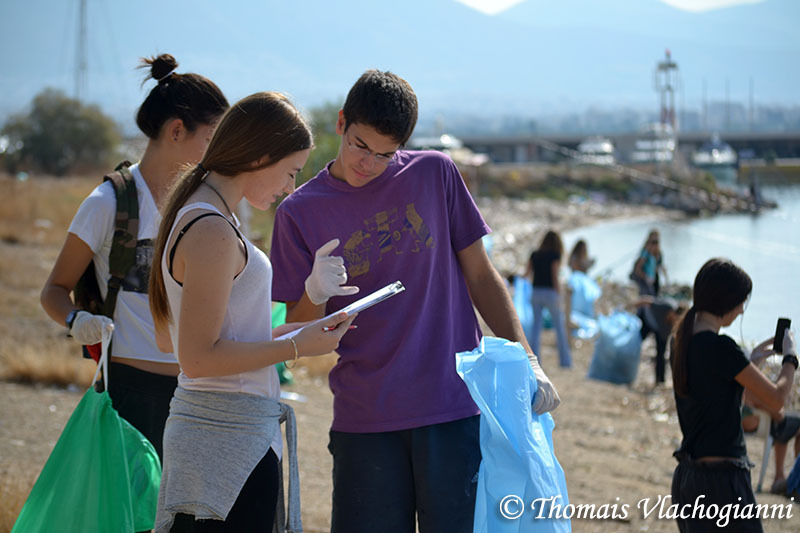 MIO-ECSDE and MEdIES, in collaboration with HELMEPA, Geitonas School and the Hellenic Recovery Recycling Corporation joined the International Coastal Cleanup (ICC) Day 2014. The ICC is the largest global volunteer effort to remove and record litter on the coastal and marine environment, bringing every year together more than 650.000 people, from some 100 countries worldwide. HELMEPA coordinated this global action for the 23rd consecutive year in Greece. The cleanup took place with the participation of some 40-50 students and their educators, as well as some local beach goers. Volunteers collected 84 bags of waste, mostly recyclable materials such as plastic bottles, plastic bags and plastic packaging; glass bottles; straws, beverage cans; caps/lids, etc. Detailed data from the ICC cleanups carried out throughout Greece will be published by HELMEPA in the next coming months. Participants of the cleanup had the opportunity to visit an innovative marine litter exhibition, set up on the beach, aiming to raise awareness on the root causes, the impacts and the solutions of the marine litter issue. The exhibition has been developed by MIO-ECSDE within the FP7 project entitled: MARine LItter in European Seas – Social AwarenesS and CO Responsibility (MARLISCO, www.marlisco.eu). It has been translated in 14 languages and has been launched in 12 European countries. In Greece the MARLISCO exhibition has been produced with the support of the Coca-Cola System in Greece (Coca-Cola Hellas & Coca-Cola Tria Epsilon). The event was also supported by the DeFishGear project, a science-policy initiative aiming to improve knowledge on the occurrence, amounts, sources and impacts of marine litter to facilitate the efforts of policy makers and stakeholders in effectively dealing with this issue in the Adriatic MacroRegion (www.defishgear.net).